Watch for President Trump’s State of the Union address on Tuesday evening – some reference to health care initiatives is anticipated to be included in his remarks. A state House of Representatives committee held hearings on several heath bills. A proposal dubbed “Simon’s Law” addresses standards for withdrawing medically futile care for pediatric patients. A compromise accord developed during the 2018 legislative session was filed as House Bill 138. The committee also reviewed HB 167 and HB 166, each of which revises current law creating criminal penalties for knowingly exposing another person to infection with HIV. The bills more broadly refer to a “serious infectious or communicable disease” and define the term. The MO HealthNet Division will reimburse hospitals billing outpatient originating site telehealth fees the lesser of usual and actual charges or $15.60 for dates of service on and after Jan. 1, 2019. Before Jan. 1, hospitals were reimbursed a percentage of billed charges. The change in billing for this service was among those hospital outpatient services that were converted to a fee schedule to create fiscal year 2019 cost-savings for the state budget. Projected savings from this change are projected to be less than $25,000 annually. 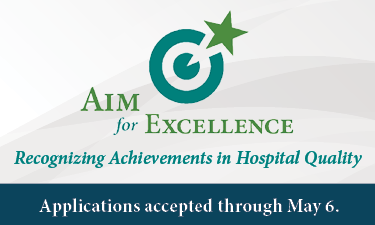 MHA is again pleased to announce the call for applications for its Aim for Excellence Award — an annual, prestigious award to recognize Missouri hospitals’ innovation and outcomes. The award will recognize up to six member organization- or team-based projects that address at least two Triple Aim principles of better health, better care and lower costs. Awards will be presented at MHA’s Annual Convention & Trade Show. Applications must be received by 5 p.m. Monday, May 6. Visit MHA’s website for more information and to apply online. The Joint Commission, in cooperation with Centers for Medicare & Medicaid Services’ subcontractors, is offering a series of webinars to provide concepts about clinical quality language expression language for the 2019 electronic clinical quality measures reporting period. A webinar in this series is scheduled at 11 a.m. Tuesday, Feb. 26. Topics of discussion include a review of measure logic and common issues related to the VTE-1 and VTE-2 eCQMs. Additional information, including a registration link, is available. Missouri ranks fourth in the nation in how well it uses Medicaid programs to serve people with intellectual and developmental disabilities. The study considers 30 measures in five categories — promoting independence; promoting productivity; keeping families together; serving those in need; and tracking health, safety and quality of life.